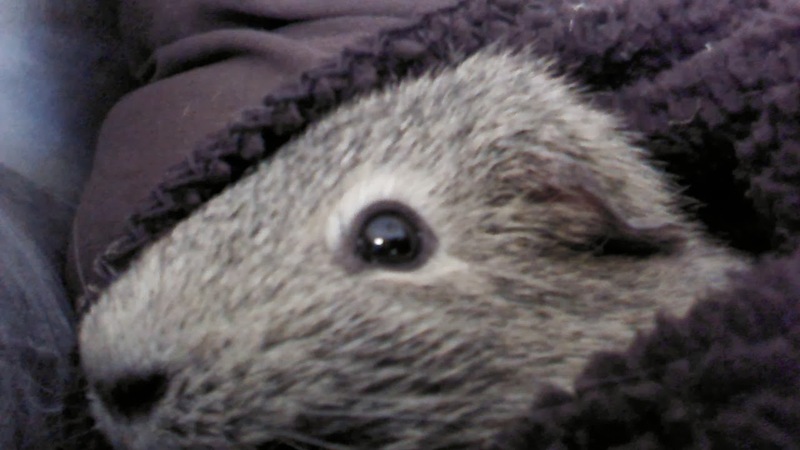 My guinea pig sisfur Dottie isn't doing very well, pals. She's getting older and she suddenly started acting ill yesterday morning. Dad was the first to notice. She was sitting, just staring at the wall of her cage yesterday morning. She wasn't talking or interacting at all. Mama noticed there wasn't much water gone from her bottle and asked who had last filled it and when. Dad had filled it the morning before. It should have been almost empty, but was only down about an inch. Grandma also said that the hay in Dottie's feeder was from the day before. Mama picked her up and Dottie didn't try to wiggle away at all. When she held her close she noticed how cool she was. That wasn't normal. Mama called the vet to see if they could bring her in to be checked out. 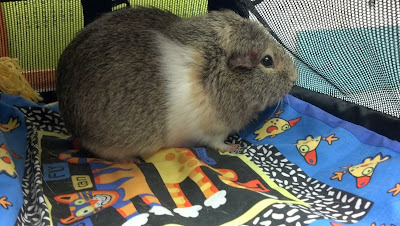 Unfortunately, the vet who works on Sundays doesn't know much about guinea pigs, so they had to make an appointment for first thing Monday morning. Meanwhile, Mama bought some vitamin C liquid to give her in case the problem was scurvy. She gave Dottie a dose, plus some water, then wrapped her up in her blanket and put her in a little cat bed. She filled up some water bottles with hot water and put them in the bed with her. 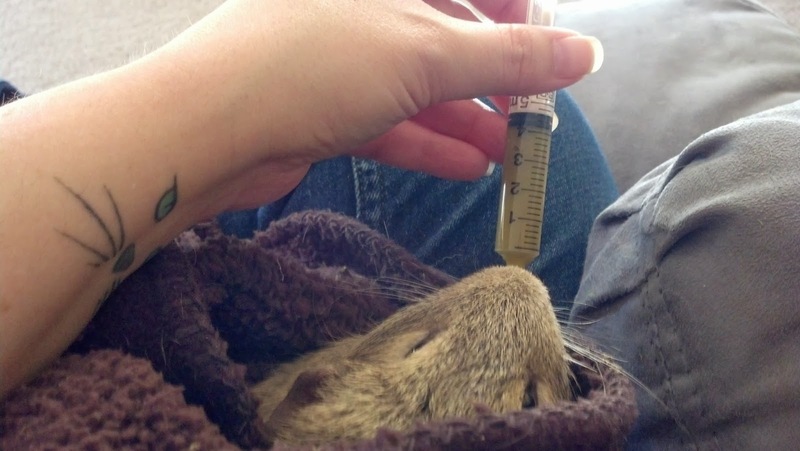 Later, a friend of Mama's who also has guinea pigs suggested that she mush up some of Dottie's pellets in some water and give her that by syringe, too. Dottie didn't like it, but Mama did the best she could to get some nutrition in her. Mama then put Dottie back in her cage with a newly warmed water bottle and told her goodnight. She prayed that Dottie would still be alive in the morning. This morning, Mama got up and checked on Dottie. She seemed about the same. Mama got ready and her and Dad took her to see Dr. Krogh at Banfield. Dr. Krogh was very thorough in her exam of Dottie. She explained that at over 4 years old, she was elderly. She didn't find anything wrong with her during the exam. Her teeth were fine and so was her heart. She was skinny, but that was all. Dr. Krogh said that they could do bloodwork and x-rays to see if there was a tumor or if her liver or kidneys were failing. 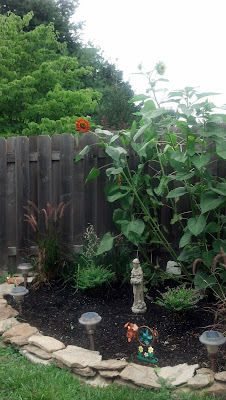 Mama asked if they found something like that, was there anything they could do? Dr. Krogh said no. She also said that Dottie was probably just experiencing normal aging issues. Mama and Dad decided not to go through the diagnostics. Instead, they asked what they could expect and how to best care for her. Dr. Krogh explained how they could keep syringe feeding her using baby food. She also said it was important to keep her warm since she wasn't able to maintain her body temperature by herself. She said to watch for her appearing to be in any pain or if she wasn't taking any food from the syringe. Mama asked how long she thought Dottie could maintain like that. Dr. Krogh said that as long as she was taking food from the syringe, she could hang on for months. She said that if Dottie couldn't walk anymore or was hurting, that would be time to let her cross the bridge. Mama and Dad took Dottie home and got her comfy. Mama bought a few kinds of baby food to try out. Dottie hasn't been very cooperative taking the food from the syringe yet, but Mama and Dad are hoping that after getting a little food in her, it might stimulate her to eat a little more. Mama is going to set up her desk lamp next to Dottie's cage to keep it warm overnight. Her and Dad are determined to help Dottie live as comfortably as she can for as long as possible. Please send good thoughts that Dottie will eat and that we will have her around for a long time to come. 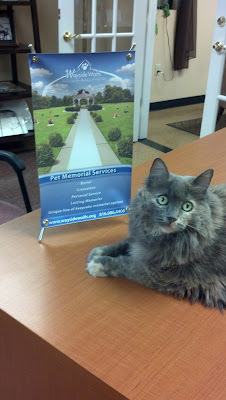 Today is National Pet Memorial Day. 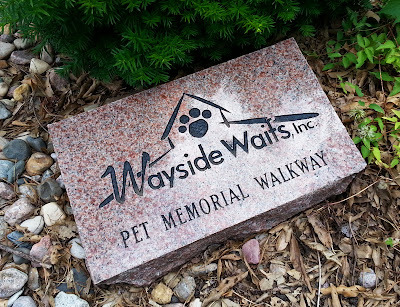 It was started by the International Association of Pet Cemeteries and Crematories over 40 years ago and is recognized the second Sunday in September. 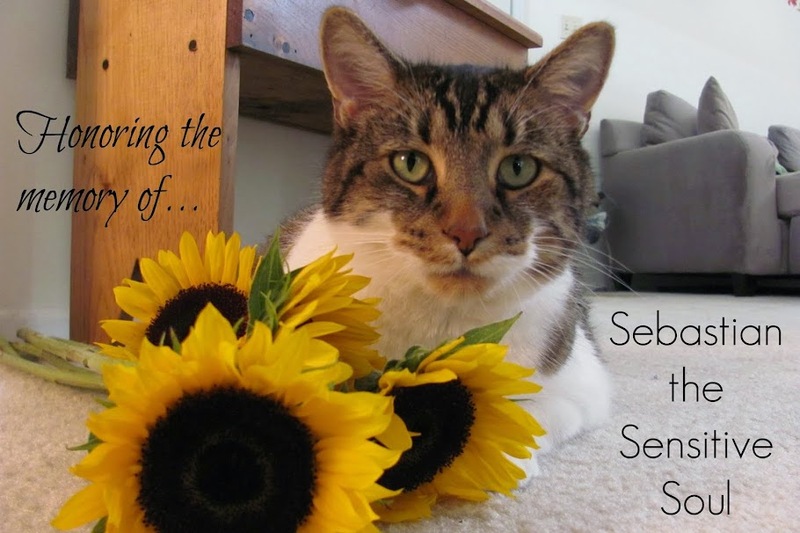 We all do special things to remember our pets who have passed. For me, Mama planted a garden in my memory. 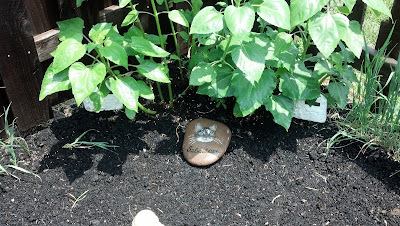 She even had a friend paint a special rock with my picture and my name on it. 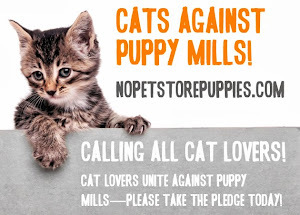 There are many ways to remember a special pet and help ease the heartbreak of losing them, but have you ever considered where it really starts? For many people it is at the pet cemetery where arrangements are made. 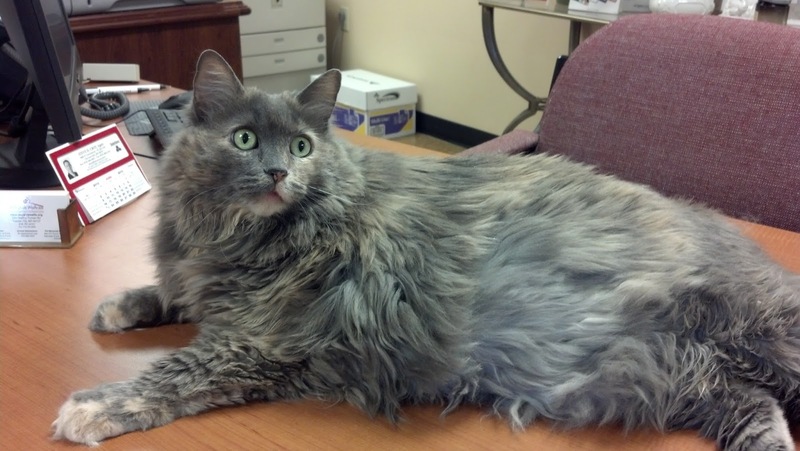 At Wayside Waifs, there is a special department just for times like those. Pet Memorial Services is a quiet spot behind the shelter where Mama took me after I went to the Rainbow Bridge. They were very kind and compassionate. While Mama and Dad were there, not only were they cared for by the people who work there, but by another special employee, Miss Ellie. Miss Ellie had been up for adoption at Wayside Waifs. The folks at Pet Memorial Services looked at her resume and decided she would be a good fit with them. Guess what? They were right! Miss Ellie does a great job of offering comfort to grieving families. It was so nice for Mama to have a kitty to pet while she was making hard decisions. Miss Ellie didn't even mind the tears. I hope that when the time comes, you have a similar expert to get you through that moment.